The smaller of our two seal species, Common Seals (also known as Harbour Seals) are more commonly found around sheltered shores and estuaries, where they haul out on sandbanks and beaches. A tell-tale sign of the Common Seal is when out of the water, they sometimes hold their body in a curved 'banana' position, with their head and tail both in the air at the same time. 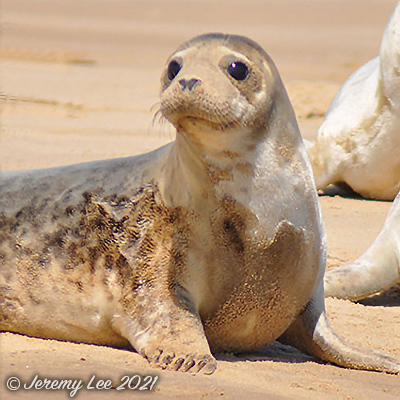 Like Grey Seals, they feed on fish, but also eat squid, whelks, crabs and mussels. The young are born during the summer. Can be distinguished from the Grey Seal by its smaller size and shorter head with a blunter, more dog-like profile. Very variable in colour, from blonde to black, but generally grey with dark spots. Found around the coasts of Scotland, Northern Ireland and eastern England.